For those of you who didn't know, I'm an astronomer, and my research field is this - protoplanetary disks. These are the rotating disks of gas and dust that surrounds new-born stars. Inside these disks planets form. We see these disks around stars that are born today - and it is how it looked when our Sun was born 4.5 billion years ago. 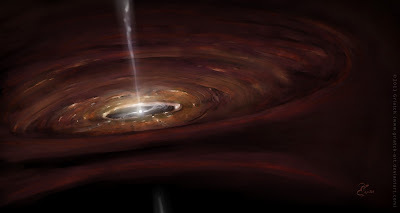 A protoplanetary disk is a chaotic place - we were born in chaos, and the final layot of our solar system and planets is a direct result of how the disk behaved and developed over the 5-10 million years it existed before our growing sun became so bright as to evaporate it. We cannot actually take as high-resolution a picture of a disk as seen here - not even our strongest telescopes are capable of this. I create computer models of such disks and compare them with what we can actually observe of the real thing - this way we can learn more about how they work internally. For posters and scientific presentations I have always used various artistic impressions of disks grabbed around the web. Figured I should be able to make one of my own so I don't have to worry about breaching some poor artist's copyright. The gas surface is clumpy and gas becomes energized where the star's light happen to hit the raised parts. With some good will one might make out some yelowish dots in gasseous gaps, precursors to giant planets. Note that the perspective is a bit skewed - we are seeing the sloping edges of the disk, but in reality those edges would of course extend also on this side, obscuring our view. So instead I show the cross-section of the disk and cut away the obscuring foreground. These disks are only warm close to the center (the innermost 10AU or so), out towards the edges (disks can be 50-1000 AU depending on where their stars are born) or deep inside where the newborn star's light cannot reach, they are very cold - very close to the absolute zero.